Quick and easy broccoli salad recipe, made with simple ingredients in one bowl in 15 minutes. Creamy, crunchy, loaded with mayonnaise, cranberries & pecans. In a salad bowl, mix together, mayonnaise, sour cream, vinegary, sugar, salt, pepper, parsley (optional). 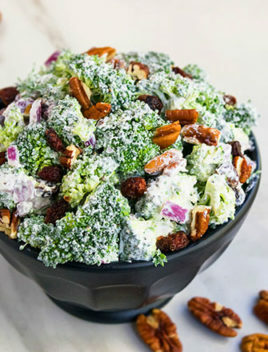 Add broccoli, onions, cranberries, pecans and mix everything together until broccoli is fully coated. Chill in the fridge for about 1 hour so that the flavors get soaked into the broccoli florets and enjoy! Leftovers can be stored in a sealed container in the fridge for up to 1 day.